Laura was married in June, so we planned her bridal session for late March. I usually suggest planning your bridal session about 6-8 weeks before your wedding, so you’ll have plenty of time to pick your favorites and have them printed and framed before the big day. More than that, planning so far in advance gives you time to take your dress back to alterations, if needed. There is such a difference in standing on a pedestal in a dressing room and only seeing your dress from the front in the mirror and actually wearing your dress and being able to walk around in it. 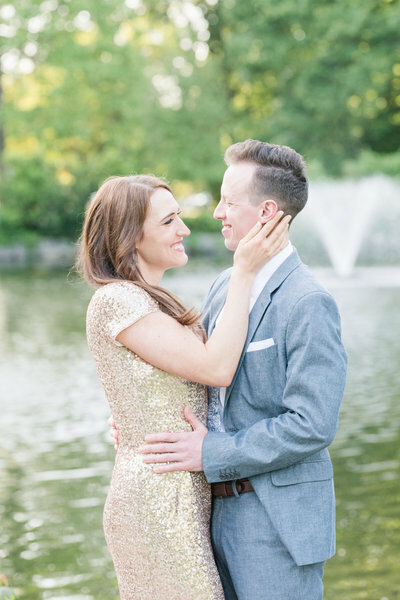 That’s a huge perk to having a bridal session! Laura was one of those brides who had changes made to her dress before the wedding day to make sure it was 100% perfect before the big day! The bridal session is also a great time to do a trial with your hair and make-up team before you commit to a certain style for your wedding portraits. 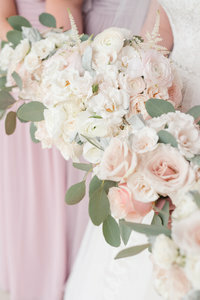 You can even get a mock-up of your bouquet to make sure it’s exactly what you’ve been envisioning! For all those reasons, and giving you an excuse to wear the prettiest dress you’ve ever worn TWICE, I absolutely adore bridal sessions! 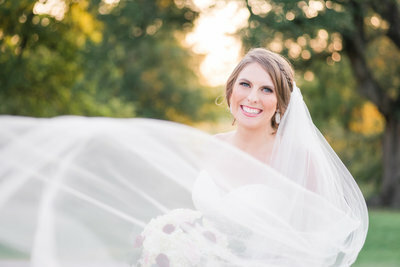 Here is a peek at Laura’s Southwestern University Bridal Portraits in Georgetown, Texas. 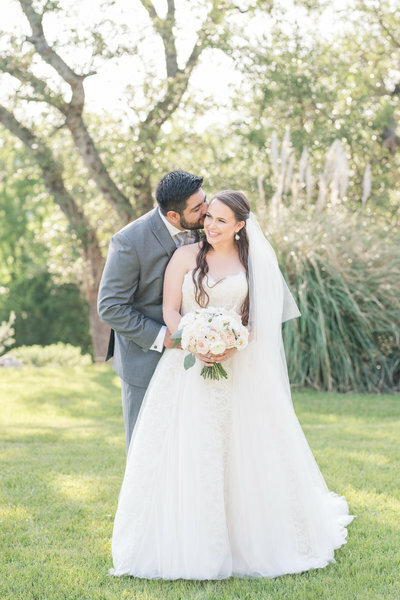 Laura’s wedding took place at The Lois Perkins Chapel on the campus of Southwestern University in Georgetown, Texas. That’s where she wanted to take her bridal portraits. I arrived early to her session to walk around to find the best lighting and backdrops for her bridal portraits. The building next to the Chapel had this beautiful stone railing that had a European feel to it. I’m so glad she trusted me to shoot somewhere a little different than where she had planned. 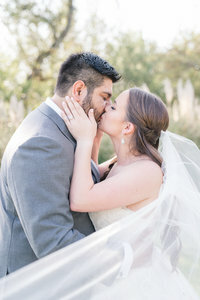 This first location has some of my favorite shots from Laura’s Southwestern University bridal portraits! This little courtyard at the chapel is where she would share her first look with Garrett on their wedding day. I loved these iron gates! Laura’s dress is SO beautiful! I absolutely loved the cut-outs on her wedding gown! The feminine details make it one of my favorite dresses from this year! Since we did shoot her bridal portraits in late March, Laura asked if we could possibly include some Bluebonnets in her session. At the very end, we all piled in the car as her sister drove us a few blocks to a field of bluebonnets. I’m so glad they were up for the adventure! This shot is the one that Laura used as her bridal portrait to showcase on her wedding day. The sun had already set and the moon was out. It just perfectly aligned with the bluebonnets we found and the colors in the sky complimented the state flower so well! Sometimes, it’s the “let’s just try it and see what happens” shots that turn out to be the favorite! 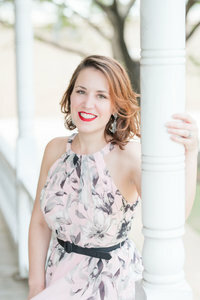 Laura – thank you so much for making the drive into Georgetown for your Southwestern University Bridal Portraits. I had fun running around (literally) with y’all that afternoon and am so glad we were able to hang out with y’all afterwards! Thanks, again, for inviting us to dinner with y’all! We loved getting to know more of y’all’s story before the big day!